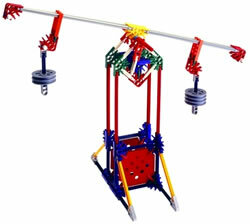 Square panels may be attached within a square made from four K'NEX rods. Square panels are available in a range of different sizes and colours, and can be purchased in our K'NEX shop. A simple example of the use of square panels may be seen in the balance model opposite.